I hope you’re walkin’ into good things this year. The Female Human has been dealing with a bunch of stuff she calls “stress”. When I told her I didn’t understand what this “stress” is she explained that it’s a bit like when someone rings our doorbell..over and over. Meowza! That stress stuff is nasty! I’m glad that she’s feeling up to her Purrsonal Assistant duties again and I hope you enjoy these first 2019 web wanderings. Normer Adams retired from his career as a social worker and now works as a treed-cat rescuer. In less than 2 years since he began his cat saving crusade he’s rescued 91 felines (an average of one a week). Now you humans know we cats are great at climbing trees but we’re not so great at getting down the tree. Mostly we try to back down but Adams has seen cats trying to head down face first and when we do that we drop like a rock. I saw two paws up to this man who understands felines and who is willing to help extricate us from our mistakes! Ontario SPCA is Hiring Cats! I realize many of you humans are big fans of online games but don’t leave your feline out of the fun. The cat in this video is called Mao Mao and she took over the game when her human set the tablet down. I might remind you all that our Female Human gave us a little iPad to play with when we were kittens. I got bored with the fish game but now I’m thinking I should check out some of the other games. Play on my feline furiends! And check out Mao Mao’s moves on the video. 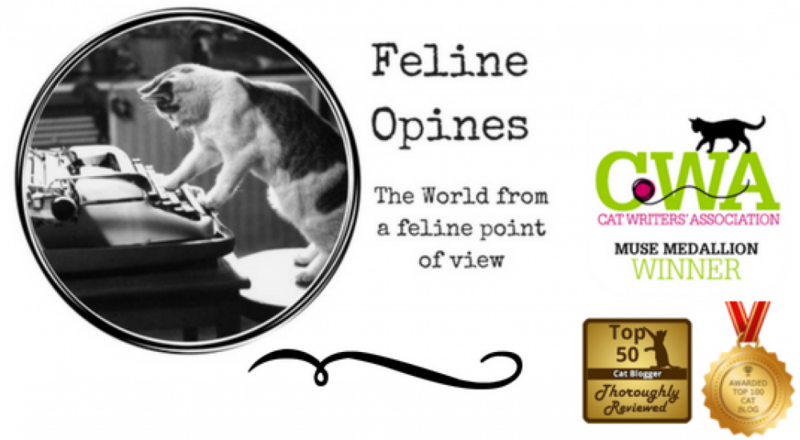 What’s better than a cat café? How about a cat café that runs out of cats and has partnered with a rabbit rescue to find furever homes for bunnies. Talk about a win-win situation! Vancouver’s very popular Catfe has been such a success that they ran out of felines in December. So what did these enterprising humans do? They partnered with Rabbitats Rescue society in an event that’s so popular it’s been extended to the end of the months. And the coolness factor for this cat café is pretty big…it was actually visited by Adele! Check out the video! We love it when humans come together to do good things for felines and these 65 people did a great thing for feral cats in Omaha by building them shelters. These “crafty humans” built out of 20-gallon plastic storage bins. Each volunteer provided at least one bin that was filled with Styrofoam and filled with straw. I think my feline furiends should get your humans involved in something like this, especially if you live in a cold place like we do!